A Checkpoint Ring (originally known as a Middle Ring, also parsed Middle-Ring) is a ring of light in Super Mario World 2: Yoshi's Island, Yoshi's Island: Super Mario Advance 3, Yoshi's Island DS, and Yoshi's New Island. It appears partway through most stages and serves as a checkpoint. If a Yoshi loses a life after passing through one, he can restart at the point of the Checkpoint Ring. Also, passing through a Checkpoint Ring will increase Yoshi's Star Power by ten and turn all on-screen enemies into stars. 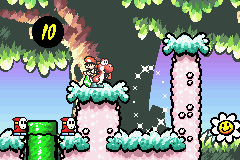 If Yoshi loses a life after reaching a Checkpoint Ring in the Yoshi's Island games up until Yoshi's Island DS, the player keeps the star count (including the extra 10 from reaching the ring) and eggs that they had when they touched it. However, in Yoshi's New Island, the player's star and egg counts reset to 10 and zero, respectively, if Yoshi loses a life and restarts from a Checkpoint Ring. Despite their original name "Middle Ring," they are not always placed in the middle of a stage. Some can be found at the very beginning, or not until near the end. A few stages even have multiple Checkpoint Rings and there are always a couple before boss fights. ↑ Nintendo3DSuk. (March 11, 2014). Yoshi's New Island - Launch Trailer (Nintendo 3DS). YouTube. Retrieved May 6, 2015. This page was last edited on December 6, 2018, at 13:29.